Routes: 12-day Grand Mediterranean (Venice to Barcelona, Spain, and vice versa) with calls on Dubrovnik, Croatia (Istanbul on eastbound itineraries); Kusadasi, Turkey; Athens and Mykonos, Greece; Naples, Rome, and Florence/Pisa, Italy; and Toulon, France, through October. After repositioning to Fort Lauderdale in November, the ship will sail a seven-day Eastern Caribbean itinerary calling on St. Thomas, St. Martin, and Princess Cays through late April 2015. Couples of all ages (romance is a long-running theme for Princess) and families seeking a large-ship experience that’s not overwhelming in a Las Vegas-meets-theme-park kind of way. Families with active young children who are more enamored with water slides and TV cartoon characters than more adult offerings, or for singles seeking high-octane nightlife. Executive Chef Alfredo Marzi, hailing from Italy, creates flavorful cuisine with a Mediterranean focus, including fresh-from-a-brick-oven pies in Alfredo’s Pizzeria and house-made pastas in Sabatini’s. A giant TV screen towers over the Fountain Pool, playing Movies Under the Stars — and the sun, for that matter. We love that the familiar opening notes of “The Love Boat” theme are tooted on the ship’s horn at sail away. Regal Princess may be massive, but she’s surprisingly unintimidating. Credit goes to the cheery, upbeat staff for making the upcharges seem like not such a big deal. Sanctuary provides respite from the lido deck crowds. There’s a certain kind of cruise passenger that craves consistency: classic rather than trendy cuisine, decor that’s tasteful rather than over the top, and onboard activities that don’t require a harness or surfboard. Princess knows this, and its newest ship, Regal Princess, makes understated consistency an art form. Virtually identical to Royal Princess, which was christened in June 2013 by Her Royal Highness, Catherine, the Duchess of Cambridge (aka Kate Middleton), Regal Princess plays it similarly safe with signature subtlety. Its photogenic atrium, the Piazza, is a social hub and home to a gelato counter, Bellini’s Bar, and Crooners Lounge — where you can sing along with the piano players, if that’s your thing. The ship’s top deck is dominated by a big screen playing movies — everything from classics like “Dirty Dancing” to current hits like “Gravity” — and concert videos (we saw Beyonce and Billy Joel) all day and into the night. Onboard décor is pleasantly contemporary. If you like travel photography, you can see the world just by walking the hallways, which are lined with framed photos submitted by passengers. 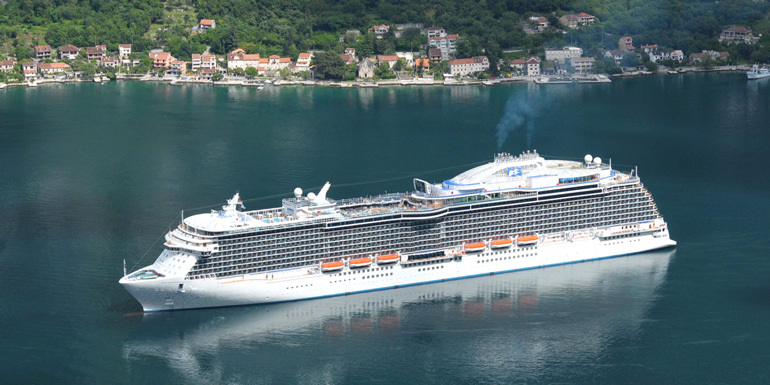 Even with 3,000-plus guests, Regal Princess has few bottlenecks and never feels crowded. On our sailing, 45 percent of the passengers were American. Of the 58 other countries represented onboard, the next largest groups hailed from Canada, Australia, and Great Britain. Tip: Anyone needing to stay connected for more than a few minutes a day will find the Wi-Fi pricey (plans start at $69 for 100 minutes) and, as is the case on most ships, unreliable. Connectivity on our sailing was consistent in the Piazza and in midship cabins, but the signal dropped frequently in cabins located far aft. 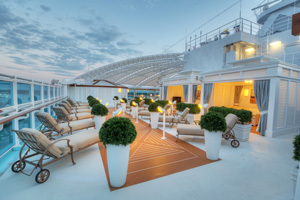 While other cruise lines are designing their newest ships with two-story, loft-like suites featuring baby grand pianos or glass-walled showers that jut out over the edge of the ship, Princess offers five decidedly straightforward cabin categories. What does matter on this ship is location — for good Wi-Fi and stairway access, but also for movement and noise issues. While the waves are barely noticeable in most areas, cabins at the very aft, which include some of the top suites, do shimmy a bit when the ship is moving at a good clip. This can be soothing, but clanging hangers in the open-plan closet/dressing area woke us in the middle of the night. And unless you’re a very early riser, be wary of aft to mid-aft cabins on Deck 15 beneath Horizon Court, where breakfast prep begins well before the 6:30 am opening time. Location aside, all cabins come with a flat-screen TV, mini-fridge, safe, hair dryer, and 220- and 110-volt outlets. A large amount — about 80 percent — have a balcony. Interior cabins are a compact 166 to175 square feet, and they’re well-designed with an open-plan closet and a queen bed that can be converted to twins. The bathroom, while small, is also well-designed, with a curtained corner shower stall housing shampoo and body wash dispensers, a single sink, and decent storage. Balcony cabins are 222 square feet (including a 41-square-foot balcony) and feature a queen bed (convertible to twins), a desk with a chair, a single armchair, and coffee table. The bathroom is the same as those in inside staterooms, as is the open-plan closet/dressing area. You’ll have a bit more space in the 360 deluxe balcony (some with partially or fully obstructed view) and premium deluxe balcony cabins. At 233 to 312 square feet, these feature the addition of a sofa bed, which can accommodate a third passenger. The bathrooms are the same as in balcony cabins. Only in a mini-suite with balcony and premium mini-suite with balcony (which has a larger balcony) will you notice a significant jump in space, to 299-342 square feet. In these, you get living and sleeping areas that are roomier and divided by curtains, as well as a larger bathroom with a combination tub/shower. The top accommodation is the suite with balcony. There are three types: penthouse suites (440 square feet with an 83-square-foot balcony), premium suites (554 square feet with a 69-square-foot balcony), and owner’s suites (587-682 square feet with a 338-square-foot balcony). All have distinct sleeping and living areas with a sofa bed, two armchairs, and two 42-inch flat-screen TVs — as well as a large bathroom with a separate tub and shower and a commode area with a second sink separated by a door from the main bath. The size of the owner’s suite balcony, a wraparound with a wake view, is the major differentiating factor. Suite passengers are also entitled to a complimentary mini-bar setup, upgraded toiletries, and an exclusive breakfast served in Sabatini’s. The ship’s major design flaw is the lack of a midship passenger stairway, so if your cabin is midship and you want to run up or down a few flights, you can’t. Decks 5 and 6 also dead-end at the midship dining rooms, meaning you need to use Deck 7 to get to the aft stairway and elevators. Food is one of the most consistent — as in reliably good — aspects of Princess ships. The main outlets are three dining rooms (serving a well-executed daily dinner menu with plentiful choices and an option of traditional or anytime dining) and the buffet-style Horizon Court, which serves breakfast, lunch, and dinner. 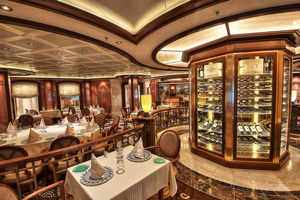 This ship isn’t studded with numerous specialty restaurants like some of its competitors, and rather than taking a stab at everything from Japanese teppanyaki to Brazilian churrascaria, Princess gets the basics right. Both Sabatini’s (for authentic Italian dishes, from creamy burrata to herb-salt-crusted branzino) and Crown Grill (for excellent steaks and seafood) are a great value at a $25 per person. Also a worthy experience: the $40 per-person Wine Maker’s Dinner, which pairs wines from select winemakers with multiple courses served in a circular room lined with wine bottles. The ultimate splurge onboard — at $115 per person — is the glass-enclosed Chef’s Table in the Allegro Dining Room, where 12 guests can enjoy a meal specially prepared by the chef. Other musts: Neapolitan-style pizza at Alfredo’s, the pub lunch at Wheelhouse Bar (both free), and Gelato ($4 for three flavors). Seafood lovers can try oyster shooters and smoked Balik salmon at Ocean Terrace (which has à la carte pricing) and steamed crab legs and peel-and-eat shrimp at the crab shack, an area of Horizon Court set aside on certain nights ($20 per person). Of the 10 bars and lounges, favorites include Vines in the Piazza, which offers 30 wines by the glass, and Outrigger for salt-rimmed margaritas and Mexican treats. Fiera blends vaudeville with modern pop. This ship is not ideal for anyone craving late-night fun: Club 6, with its small dance floor, DJ, and backlit cocktail menu, and the adjoining casino are as lively as Regal Princess gets after dark. You’re more apt to find couples snuggling on chaises watching Movies Under the Stars. Nor will this ship satisfy guests who adore full-scale Broadway musicals — although the Princess Theater does stage original shows on each sailing, including “Fiera,” a carnival-themed love story set to hits by Lady Gaga, Michael Jackson, and others, and the opera-centric “Bravo,” as well as a couple comics. 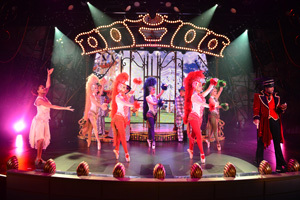 Other entertainment includes a piano player in Crooners Lounge, theme nights in Vista Lounge, and Princess Live — a TV studio that hosts reality- and game-show-inspired activities, including a karaoke competition. By day, guests can keep active in the fitness center or on the excellent jogging track and basketball court. Social types mingle in one of the five hot tubs, while seclusion seekers unwind at the free adults-only Retreat Pool, or pay $140 for a half-day cabana rental at the pool-less Sanctuary. (Can you tell we preferred Retreat?) In addition, the Lotus Spa has 18 treatment rooms and a thermal suite, though you’ll encounter an extra cost for access to the suite. Because Regal Princess spends adequate time in most ports — from seven to 12 hours on her European sailings — you don’t need much more onboard activity than what’s offered. The line provides between six and 10 shore excursion options in each port, and the ship’s size dictates that these are all big-bus tours, with knowledgeable (if not always captivating) guides. This is a sightseeing-heavy itinerary, with lots of great ports, but if you book tours for every day you will come home very, very tired. For variety, mix it up — take an excursion to Ephesus from Kusadasi or to Pompeii from Naples, but wander around Dubrovnik and Mykonos on your own. What do you like about the newer Princess ships? How much does each ticket for "Movies under the stars " cost approximately?